A supermodel I think. I can't remember where or how I found her but here is a drawing of her. If anyone has any clue of her identity , please let me know. 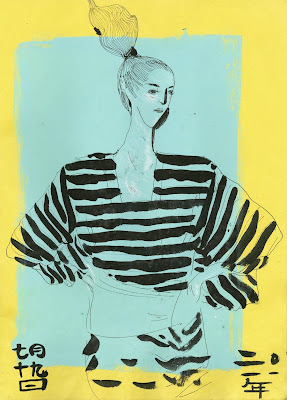 Yelena Bryksenkova inspired me to draw more women. She has also inspired me in terms of patterns, clothing, fashion illustration, and all things Russia.